Hoboken has become a hub for families, fun events, and awesome kid-friendly activities. It has a big city feel, yet great smaller town charm with endless things to do. You can choose to spend the day at a museum, boat on the water, walk a park, visit a delicious bakery, and heaps more. There are so many things to do in Hoboken, it can be hard to choose the best options for your family. Let’s explore some of the best things to do in Hoboken that will have you and your family happy, engaged, and having tons of fun! Hoboken Pier A puts on movies at night time all summer long. This is the perfect activity to gather up so delicious snacks, cozy blankets, lay out on the grass on a warm summer evening watching a fun movie. The kids will think this is the coolest idea ever and will keep them occupied the entire time. Although they may not always play to most kid-friendly movies, there are plenty of nights where they do making it great for the whole family to attend. These outdoor movies are among the best things to do in Hoboken for the whole family. This is a great event for babies and toddlers to attend. They put on weekly puppet shows the little ones are sure to love. This is always a great way to meet parents in the area and for your kids to make friends as well. 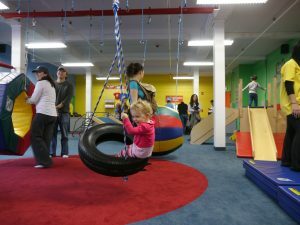 It is definitely one of the best things to do in Hoboken with the very little ones. It’s never too early to get your kids interested in history and learning. Bring them to the Hoboken Historical Museum for Penny’s Storytime and Family Fun Days. It is always great when you can find activities that the kids will not just enjoy, but they can learn as well. Great for birthday parties or just a fun and active day out with the kids, My Gym is always a great option. They have different age classes, summer camps, and open play time. They have areas to run, slides, swings, things to climb in, around, and over. There is a little something for every kid to enjoy. This enrichment program offers some great fun and educational summer programs for the kids of all different ages. 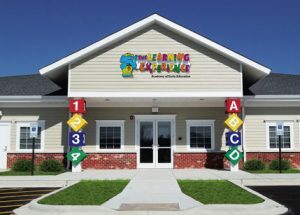 “Children complete science experiments, learn new sign language and create exquisite art projects while still having plenty of time for sun and fun in one of our state-of-the-art outdoor playgrounds. To provide further entertainment, centers are visited by special guest performers throughout the summer weeks.” If you are looking for a children’s activity to keep them learning and engaged throughout the off summer months, this is a great program worth considering. And best of all, the kids will have tons of fun there too. This park is perfect for walking your dog and taking the kids on a walk, especially if they will be in strollers. There are two great playground areas, grass, and beautiful mature trees. The park also has basketball courts, tennis courts, passive space, grass, and plenty of room to run. 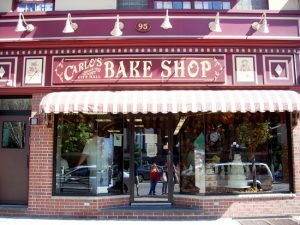 If you are looking for a sweet treat, look no further than the famous Carlo’s Bakery in Hoboken. Home to the famous TLC show, this bakery offers up delicious cookies, cakes, cupcakes, Italian desserts, coffee, and more! You can even sign up for a baking class with the older kids and learn how to make some of the yummy desserts. This is the perfect place to do something totally different and explore your creative baking side with your older kids. Pier A is an iconic location in Hoboken and is perfect for a family outing. There are tons of places to walk, concerts throughout the summer months, and the most stunning view in all of Hoboken. During the day, it is a great place to bring a blanket or towels and soak up some sun with the kids. You can bring footballs and soccer balls the sick and toss around – a great way to get active. You can even fish off of the pier. 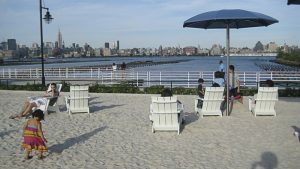 There are an endless amount of things to do at Pier A, making it one of the bets things to do in Hoboken for families. The Boathouse is a must-do activity in Hoboken, especially during the summer months. It is an awesome way to get active and spend some time on the beautiful river all at a very budget friendly cost…because it’s free! This is great if you have a large family and don’t want to spend tons of money on pricey events and activities throughout the city. A quiet park located by the water, this is a great spot of you are looking for a place that is less crowded than many other popular parks in Hoboken. Here, you have access to free kayaking, a fun playground for the kids, and wide-open grassy spaces to lounge out with a blanket and a picnic. The playground is great because it is gated. You don’t have to worry about the kids running off or getting away from you quickly. There is also a dog park located within the park as well if you are planning to bring your furry friend. Open every Saturday from 9 am to 2 pm, you must check out this Farmer’s Market and one of the best things to do in Hoboken for families. This is a pet-friendly and smoke-free environment, which is ideal for families. You can pick up some of the best and freshest fruits and veggies, delicious baked goods, jams, jellies, sauces, and so much more. This is a great way to teach you kids about the importance of farming and eating local and healthy foods.